FILE - Volkswagen CEO Martin Winterkorn gives his closing speech during the Volkswagen group night ahead of the Frankfurt Motor Show (IAA) in Frankfurt, Germany, Sept. 14, 2015. Volkswagen CEO Martin Winterkorn resigned on Wednesday, taking responsibility for the German carmaker's rigging of U.S. emissions tests in the biggest scandal in its 78-year history. "Volkswagen needs a fresh start - also in terms of personnel. I am clearing the way for this fresh start with my resignation," Winterkorn said in a statement. A five-member executive committee had grilled Winterkorn, 68, since morning at the company's headquarters in Wolfsburg, Germany. The company was under huge pressure to take decisive action, with its shares down more than 30 percent in value since the crisis broke, and the bad news still coming. German prosecutors said on Wednesday they were conducting a preliminary investigation into the manipulation of vehicle emission test results at Volkswagen, while French Energy Minister Segolene Royal said her country would be "extremely severe" if its investigation into the firm found any wrongdoing. German Chancellor Angela Merkel had urged Volkswagen to move "as quickly as possible" to restore confidence in a company held up for generations as a paragon of German engineering prowess. The U.S. Environmental Protection Agency (EPA) said on Friday Volkswagen could face penalties of up to $18 billion for cheating emissions tests on some of its diesel cars. The story has sent shockwaves through the car market, with dealers in the United States reporting people holding back from buying diesel cars and "#dieselgate" trending on Twitter. Diesel engines account for less than 3 percent of new cars sold in the United States but around half of cars in Europe, where governments have encouraged their use to meet fuel efficiency and greenhouse gas targets. Their biggest selling point is their fuel economy and low carbon emissions compared to standard gasoline engines. But they also emit far more nitrogen dioxide, a toxic gas blamed for health problems. The suggestion that their emissions in real world conditions are worse than reported in tests could harm the whole sector and alter the future of the car industry worldwide. "The Volkswagen issue is another blackeye for the diesel engine overall," Mike Jackson, the chief executive of the AutoNation, the largest U.S. car retailer, told CNBC, adding the "brand position" of Volkswagen was at risk in the U.S. market. 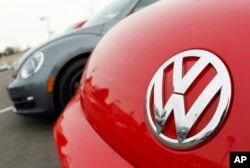 Volkswagen said on Tuesday it was setting aside 6.5 billion euros ($7.3 billion) to help cover the costs of the crisis. Analysts doubt that will be enough, with the company disclosing that 11 million of its cars were fitted with Type EA 189 engines that had shown a "noticeable deviation" in emission levels between testing and road use. The U.S. Justice Department has launched a criminal probe, a source familiar with the matter said. New York and other state attorneys general are also forming a group to investigate. Environmentalists have long complained that carmakers game the testing regime to exaggerate the fuel-efficiency and emissions readings of their vehicles. European politicians on Wednesday voted to speed up rules to tighten compliance with pollution limits on cars. European car association ACEA said that so far there was "no evidence that this is an industry-wide issue." But Societe Generale analysts said that while the uncertainty prevailed, the whole autos sector was likely to be "dead money" for a while.